Ethiopiens premierminister Meles lader sig ikke skræmme af at udenlandske donorer omdirigerer fattigdoms-bistanden så den går uden om det ethiopiske statsapparat. Meles selvsikkerhed fejler ikke noget, og det er et af problemerne i Ethiopien, hvor befolkningsgruppen fra Tigre (ca. 5% af Ethiopien samlede bef.) har opnået statsmonopol på politisk og økonomisk indflydelse og det lider stadig større dele af resten af befolkningen under. Selvom det Meles-kontrollerede regeringsparti har mere end absolut flertal i Parlamentet tåler Meles ikke kritik, og parlamentets regler er lavet om (af Meles og hans håndgangne), så oppositionen er totalt uden indflydelse og endog har fået frataget fundamentale demokratiske indsigelsesrettigheder. Indsigelser og protester resulterer i arrestationer og mange oppositionspolitiske står til meget strenge straffe for blot at have deltaget i fredelige demonstrationer i det samfund, som præsident Meles betegner som demokratisk! ADDIS ABABA, 30 Jan 2006 (IRIN) - The Ethiopian government would be able to ensure the country's development even if international aid donors reduced their assistance to the Horn of Africa country, Prime Minister Meles Zenawi has said. Meles was speaking on Friday, 10 days after Britain said it would withhold direct budget support worth around 50 million pounds sterling (US $88 million) to the Ethiopian government because of concerns about governance and human rights after a deadly crackdown on post-election demonstrations. Britain said it would redirect the funds to help provide education, better health facilities and water to the poor in donor-dependent Ethiopia. "The government has the capacity to run regular activities and main development programmes of the country through its own expenditure, should any serious measures be taken by development partners," the governmental newspaper, Ethiopian Herald, on Saturday quoted Meles as saying during a press conference with the local media. Meles denied that there was a reduction in overall aid to his country, as "some media outlets reported", but acknowledged that some donor countries were shifting budget support to other forms of assistance. "We do not believe this measure to be correct and appropriate," Meles said objecting to the reasons given for the shifting of the aid. International donors currently fund about 10 percent of the budget in sub-Saharan Africa's second most populous country. Meles also announced that the country's agricultural production is expected to show a 15 percent growth this year and that its overall economy would register a "double-digit" growth at the end of the fiscal year in June. Ethiopia was rocked by violence in June and November 2005 after the elections, which returned Prime Minister Meles Zenawi's party to power. The violence led to the death of 88 protesters at the hands of security forces and the arrest of thousands of people in the capital, Addis Ababa. The Prime minister reiterated accusations that the opposition, neighbouring Eritrea and the rebel Oromo Liberation Front (OLF) were behind recent violence in the capital and the south-central Oromia region, where there have been reports of clashes involving students and security forces. 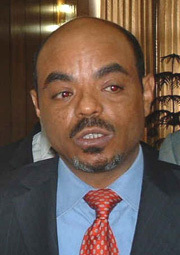 Meles has repeatedly accused the opposition of plotting to incite violence, through street demonstrations, to topple him. "They used students and unemployed youth to disrupt peace," he said, according to the Ethiopian Herald. "The government is now hunting down the real perpetrators of the violence," he added. Some 129 opposition leaders, journalists and aid workers are currently facing charges of treason, genocide and other crimes, some of which carry a maximum sentence of the death penalty.